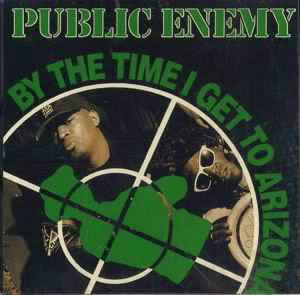 As an admirer of Dr. Martin Luther King, Jr. and a fan of Hip-Hop music, I reflect on the classic 1991 Public Enemy song “By the Time I Get to Arizona.” The song and video is a response, and to me a diss track, to former Arizona governor Evan Mecham’s opposition to observing Dr. King’s holiday. In addition to the assassination, the video depicts the racism common in the Jim Crow south along with the acts of resistance executed by African Americans in response. It’s a polarizing song/video. On one side, Gov. Mecham’s refusal to observe the holiday can be seen as racist, and Public Enemy may be applauded for speaking out. On the other hand, Dr. King’s philosophy emphasized nonviolence, and the depictions of PE’s militia, the S1W’s, performing target practice and placing an explosive under the governor’s limo may be perceived as hypocritical. I also notice genealogical undertones in Chuck’s threats to the governor. The renderings of violence in the video are reminiscent of the 1968 riots in reaction to King’s assassination. Since, Arizona was merely one of two states refusing to observe King’s birthday as a holiday (New Hampshire was the other), I doubt that Public Enemy would incite national riots on a similar scale. One may consider assassinating Gov. Mecham to be extreme, but as appreciators of Hip-Hop, we should commend PE for applying its musical genius and aesthetics to this social and political cause. The group should also be recognized for its conscious lyrics and its attention on matters important to Black people while appealing to the youth. Just like any issue affecting Blacks, we may agree that we’re there’s injustice, but we usually disagree about how to go about implementing solutions. Watch the video below.